Looking to invest in the legal marijuana industry? Learn more about investing in cannabis for beginners. Stash is giving new users a $5 sign-up credit to invest in cannabis and numerous other industries. Stash offers users investing exposure to the legal cannabis industry. You can invest in over 40 ETFs on Stash with just $5. Learn more about investing in the legal cannabis industry. Could the green rush be the next gold rush? In the last few years, perhaps no other sector except technology has generated so much–well, buzz. What is the Marijuana Industry? The marijuana industry is expected to add 200,000 new jobs in the U.S. by 2020, according to New Frontier Data, which provides research on the cannabis market. Growth is expected for a long list of businesses, such as the cultivators and packagers of the plants, dispensaries for medical and recreational marijuana, not to mention companies creating products that use cannabis byproducts called CBDs. CBDs are non-pyschoactive derivatives of cannabis, which can be used for a variety of purposes. Health professionals have touted CBDs for their ability to help patients with inflammation, chronic pain, and depression. Companies are also capitalizing on industrial uses for cannabis. This includes the production of hemp, which can be used to make fabrics and textiles, as well as its use as additives to health food and body care products. There are now 29 states that allow doctors to prescribe cannabis for medical purposes, which can include helping to alleviate nausea related to chemotherapy, and stimulation of appetite for people who are chronically ill, among other health-related issues. In January, California became the largest state in the U.S. to allow its residents to use marijuana for recreation, with a market of nearly $4 billion in 2018, according to reports. Eight states and the District of Columbia have in recent years legalized cannabis for recreational use. Despite all the excitement surrounding the sector, the cannabis sector still faces challenges. And while attitudes are changing regarding legalization, there are still issues surrounding marijuana and the law. U.S. federal law still considers marijuana use and possession to be illegal. In January 2018, for example, the U.S. Department of Justice reversed an earlier policy of non-interference in states that have legalized marijuana. That could make things more complicated for growers and sellers in these states. As of 2018, banks, which are federally regulated, still can’t accept money from cannabis businesses. Because of this, many budding companies may struggle to create bank accounts, accept debit and credit payments, and effectively navigate the tax system. Businesses in California and Colorado report challenges of dealing with a cash-heavy industry where the laws and regulations are slowly changing, but remain cloudy and unclear. Nevertheless, lawmakers seem to be working slowly toward a resolution. The Congressional Cannabis Caucus, a bipartisan group of senators and representatives, hope to resolve the conflict between federal laws that ban marijuana use, and the state laws that allow it. Also in January, attorneys general from 19 states including Hawaii, Alaska, and Colorado sent a joint letter to members of Congress, urging them to introduce legislation that would allow legal marijuana businesses to access banks and other financial services companies in the U.S.
Investors in the U.S interested in adding cannabis to their portfolios have a few options. They can purchase shares of stock in cannabis-related companies that are publicly-traded on an exchange. Another option is to purchase shares of a fund, which offers exposure to many companies leading the way in this growing sector. A single stock is just that, a share of of ownership of a company. For example, investors can purchase shares of stock in companies like Cronos Group or CanniMed. Exchange-traded funds (ETFs) are a basket of investments bundled into a fund that’s traded on an exchange like the Nasdaq or NYSE. That fund owns the stocks within it and generally tracks an index – or group of investments that represent part of an industry or investment theme. When you invest in an ETF you are effectively buying small fractions of the companies within that ETF. The fraction depends on the weights stocks held in that fund. ETFs have become popular in recent years as they give investors the opportunity to invest in the performance of a group of stocks without having to buy every single stock in the fund or handpicking single stocks. Not only can this save time and research, ETFs can offer diversification, which many consider to be an essential investing strategy. Check out the ETFs available on Stash here. *Image is used for illustrative purpose only. Stash is a financial services platform that makes saving and investing available to everyone through education, personalized guidance, and mobile-first technology. Stash speaks to a tech-friendly audience, providing user-friendly education, and personalized guidance. 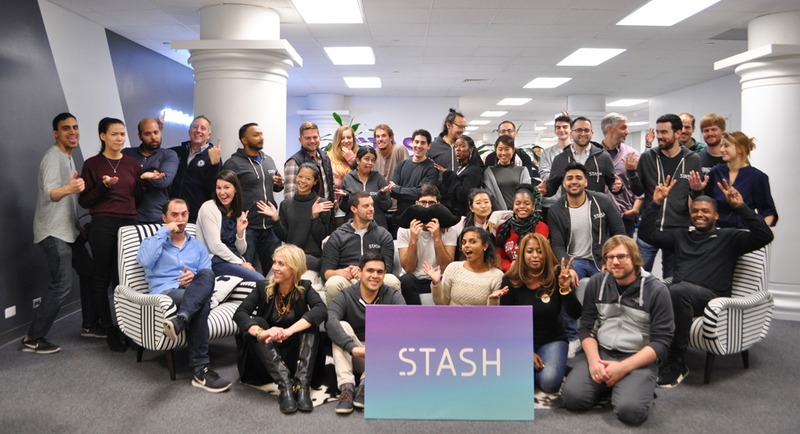 Stash is for the millions of Americans who have been overcharged and underserved by traditional banks, brokers, and investment advisors. Stash is for people who want to take charge of their financial future but need a helping hand to get them started and see them along their journey. If you are a U.S. citizen, permanent resident, or a certain visa holder, and are 18 years of age or older, you can sign-up for Stash here. Stash charges its customers $1 a month to maintain an investment portfolio for accounts with an average monthly balance below $5,000. For average monthly balances of $5,000 or more, the fee adjusts to 0.25% of the total balance you have in the account per year, charged on a monthly basis. If you decide that a retirement account like a traditional or Roth IRA is suitable for your investing goals, you can open a tax-advantaged account with as little as $15. The fee is $2 a month for accounts with an average monthly balance of less than $5,000 or 0.25% per year, charged monthly, for accounts with an average monthly balance of $5,000 or more. Stash is as an investment adviser registered with the U.S. Securities and Exchange Commission (SEC). The SEC is a federal agency that regulates the financial securities market, including exchanges, brokerage firms, and investment funds. You can find more about Stash on the SEC’s website at: adviserinfo.sec.gov, or simply click here to find out more about Stash and its registration with the SEC. What Happens if Stash Goes Out of Business? Stash has every intention of sticking around for the long term. However, if anything were to happen to Stash that required us to close up shop, you would maintain complete control of your brokerage account. All the investments in your Stash portfolio are owned by you. Your account will not face any penalties if anything happens to us. That’s because your investments are held at a federally regulated broker-dealer called Apex Clearing Corporation. This company acts as a custodian for all the investments Stash customers purchase. Apex is regulated by the Securities and Exchange Commission (SEC) and the Financial Industry Regulatory Authority (FINRA). Apex is also a member of the Securities Investor Protection Corporation (SIPC), which together protects your investments in case of bankruptcy of the company holding your investments. Stash accounts are enrolled in an interest-bearing Federal Deposit Insurance Corporation (FDIC) insured Sweep Program (“Sweep Program”) offered through our clearing firm, Apex Clearing Corp. Uninvested Cash in your Stash account will automatically be transferred into the Sweep Program and will earn interest based on the amount and duration of deposits and applicable interest rates. Deposits to the Sweep Program are covered by FDIC insurance up to the $250,000 limit per customer at each FDIC-insured bank that participates in the Sweep Program. Once your cash balances are deposited with the participating banks under the Sweep Program, they will no longer be covered by SIPC. Please ensure that you read the Terms and Conditions of the Sweep Program carefully. As with all investments, you should consider carefully if the Sweep Program meets your investment objectives. Stash uses 256-bit encryption to secure your information, including personal data and fund purchase history. Stash further secures your account with Secure Socket Layer (SSL) technology, which ensures any and all information sent between Stash and its servers is protected. Stash will never withdraw funds from your checking or savings account without your consent. In order to purchase any of the investments offered through Stash, you need to link a bank account to transfer funds and to make your desired investment purchase. If you have more questions about whether it’s safe to link your bank account to Stash, send us an email. You can also read more about Stash’s security protocols here. You can reach out with any questions at [email protected] or simply call (800) 205-5164. See what some of the biggest financial publishers are saying about us. Marijuana is still considered an illegal substance under federal law. Stash does not condone or encourage the use of marijuana or any other illegal substance. Investing in marijuana related investment products is considered high risk and should be done with caution as part of a well diversified portfolio. This material has been distributed for informational purposes only and is not intended to provide investment, tax, or legal advice or a recommendation of any particular security, strategy or investment product. This material is confidential to the recipient and must not be reproduced or distributed to any other person without the prior written consent of Stash Investments LLC (“Stash”). This material has not been independently verified, is subject to updating and amendment and the material, information and descriptions contained herein are not intended to be complete. This material discusses general market activity, industry or sector trends, or other broad-based economic, market or political conditions and should not be construed as research. This material may not be current and Stash has no obligation to provide any updates or changes. Any reference to a specific company or security does not constitute a recommendation to buy, sell, or hold any such investment. This material does not take into account the financial position or particular needs or investment objectives of any individual or entity. Certain information contained herein has been obtained from sources believed to be reliable, but not guaranteed. No part of this material may be reproduced in any form, or referred to in any other publication, without express written permission. Investors should consider the investment objectives and unique risk profile of Exchange Traded Funds (“ETFs”) carefully before investing. ETFs are subject to risks similar to those of other diversified portfolios. Although ETFs are designed to provide investment results that generally correspond to the performance of their respective underlying indices, they may not be able to exactly replicate the performance of the indices because of expenses and other factors. A prospectus contains this and other information about the ETF and should be read carefully before investing. Customers should obtain prospectuses from issuers and/or their third party agents who distribute and make prospectuses available for review. ETFs are required to distribute portfolio gains to shareholders at year end. These gains may be generated by portfolio rebalancing or the need to meet diversification requirements. ETF trading will also generate tax consequences. Investing in the bond market is subject to risks, including market, interest rate, issuer, credit, inflation risk, and liquidity risk. The value of most bonds and bond strategies are impacted by changes in interest rates. Bonds and bond strategies with longer durations tend to be more sensitive and volatile than those with shorter durations; bond prices generally fall as interest rates rise, and the current low interest rate environment increases this risk. Current reductions in bond counterparty capacity may contribute to decreased market liquidity and increased price volatility. Bond investments may be worth more or less than the original cost when redeemed. Furthermore, real estate investment trusts ("REITs") are subject to changes in economic conditions, credit risk and interest rate fluctuations. There is no assurance that any investment, including any investment that has experienced high or unusual performance for one or more periods, will experience similar levels of performance in the future. High performance is defined as a significant increase in either 1) an investment's total return in excess of that of the investment's benchmark between reporting periods or 2) an investment's total return in excess of the investment's historical returns between reporting periods. Unusual performance is defined as a significant change in an investment's performance as compared to one or more previous reporting periods. Diversification does not ensure against loss. There is no guarantee that any investment strategy will work under all market conditions or is suitable for all investors or that market conditions will not deteriorate, and each investor should evaluate their ability to invest long-term, especially during periods of downturn in the market. None of Stash, nor any of its directors, officers, employees, shareholders, advisers, agents or affiliates (together the "Stash Parties") make any representation or warranty, express or implied as to the accuracy or completeness of this material, and nothing contained herein shall be relied upon as a promise or representation whether as to past or future performance. To the maximum extent permitted by law, none of the Stash Parties shall be liable (including in negligence) for direct, indirect or consequential losses, damages, costs or expenses arising out of or in connection with the use of or reliance on this material.